After testing different mosfets to use, I went with the IRLML6344 a 29 mOhm, 30Vds, 5A continuous mofset with a sckotty diode rated at 1 amp, a quick PCB design later and we’ve got our motor controller board. 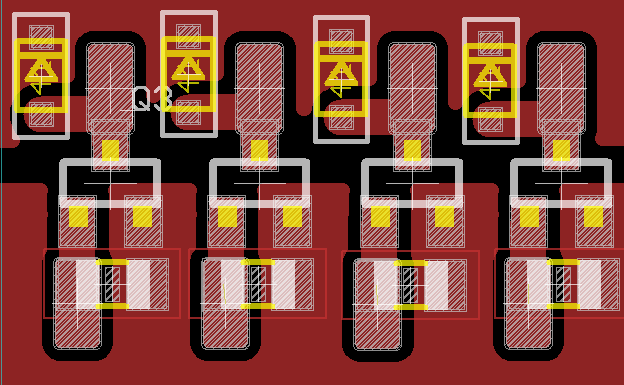 I did have some trouble testing the board, it seemed that I kept frying the mosfets in such a way that made them stay on even when the gate was low, it turns out that I forgot to connect ground to the PWM I was generating, oops. After ground was connected, it all work nicely and the mosfets didn’t really get hot. I hacked up one of my PCBs that had an ATmega footprint to act as the controller and started work on converting the MPU-6050 Arduino code to C code which took a while, I had to add some capacitors for power filtering otherwise when the motors started the MCU would reset. 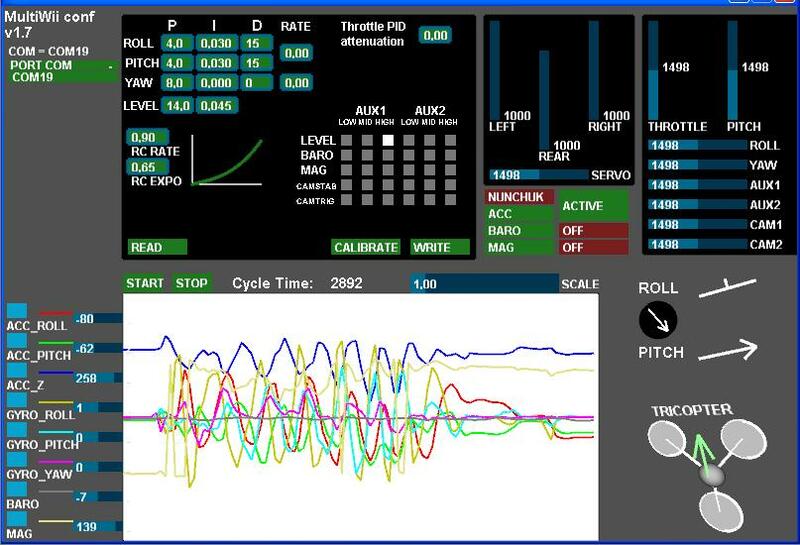 The MPU-6050 has a special DMP motion functionality which offloads the processing on the chip directly and gives you the results directly, if you don’t use the DMP motion you need to do some sort of filtering otherwise the results can be all over the place. 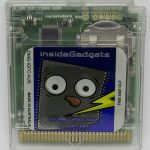 Here’s some links to learn more about using the MPU-6050 and the library I used the DMP from. Once the conversion of the MPU-6050 code was done I started playing around with controlling the motors based on the position of the MPU-6050 but it turns out that it’s much harder than it seems, but it was great to see it lift up and fly for a bit. I was doing basic things like if it was tilting to one side, it would increase the PWM cycle for the side falling and decrease for the side rising, trying to take into account a decent amount of angle before it would take place. It would slowly rev up all the motors and then it would take off, here’s where my code ended if you want to take a look: Quad_Test. As you can see in the video, I did get it to fly briefly but there was lots of oscillation and later when playing with my code it would move in one direction and slowly spin in circles. 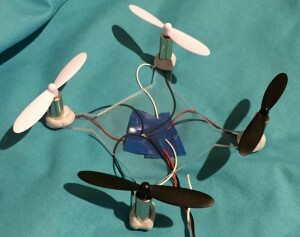 I didn’t know it back then (about a month ago when I did this build) but by default MultiWii runs in acrobatic mode meaning that it’s up to you to control the quadcopter, any adjustment you make the quadcopter will continue that action until you move it to another direction. You can set it to angle/horizontal mode which will auto level the quadcopter for you and you should calibrate the accelerometer by pressing the CALIB_ACCR button before doing so. Also the PIDs should be tuned or at the very least, you need to put the I and D gains to 0 so you can firstly focus on P (reduce it to say 1.5 to 2.5 to start with) to have it start flying. So now it hovers (better than shown in the video but requires more tweaking), all in all it was a good experience to learn the amount of processing that goes into making a quadcopter fly and I’m happy with the MultiWii software enough that I can build a bigger quadcopter, I’m starting to receive my parts for a ZMR250 build as shown on the RCModelReviews channel. What mosfet did you used ? Hi Rob, I used the IRLML6344 mosfet. I build something very similar to your copter. I used IRLML2502 mosfet. The current issue is with stability, and my copter usualy flips. Probably something is wrong with configuration. Any tip what should I check ? Is there anything in particular that you do to make it flip or is it just random? – Have you calibrated the accelerometer when it’s flat on a table by pressing CALIB_ACC? – If you move the quad when connecting the power, it could by the gyro needs calibration too when it isn’t being moved, when not armed, move the throttle to the bottom left and move the pitch to the bottom, the status LED should light for 1-2 seconds. 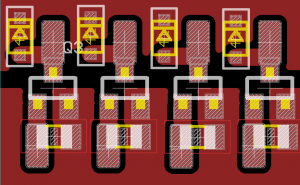 – How is the accelerometer mounted? Maybe try putting some foam under it. Also when the motors are on and near full throttle, do you see any big spikes? If so, the accelerometer may need to be mounted differently or possible the motors are causing too much vibration, may need to be secured better to the frame. – Try lowering the Level P from 9 (default) little bits at a time, you can go right down to 1 if need be, also try this for I, go in 0.05 increments. 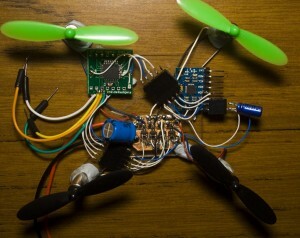 I calibrated accelerometer when quad was not armed and on flat. Should I calibrate it every time when connecting power ? As far as I checked yesterday – spikes was even when throttle was just above min. 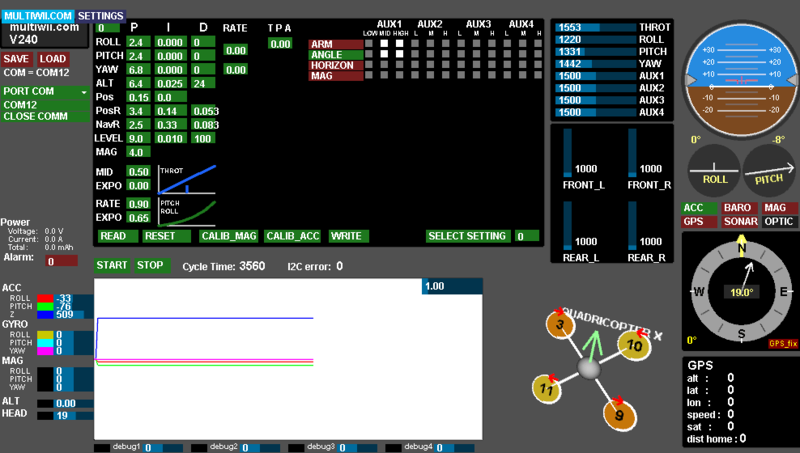 I’m using EZ-GUI to control my quad. I don’t have any other remote currently. The accelerometer only needs to be done 1 time only (and when you re-upload the sketch). Also are you running in Angle mode (which auto levels the quad)? The main changes was to set #define EXT_MOTOR_1KHZ, for brushed motors. You can check the Quad_TX-RX_v1.0.zip in the post to see my config file. hey. i’m going to make this. i’ve learned alot of c-programming. what are all the parts? 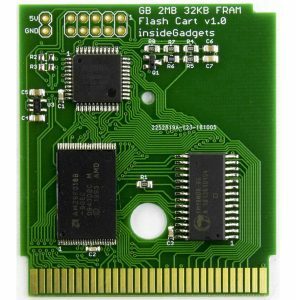 and how did you hack the pcb into a flight controller? thats a power distribution board right. you made that yourself. Yes I just made a PDB/ESC you could call it, for the motors. Really all it is, is mosfets on a PCB with a diode and resistor. If you wanted to, you could use a TO220 style mosfet (but it might weight a bit). There isn’t too much programming needed, more just understanding where to connect everything. 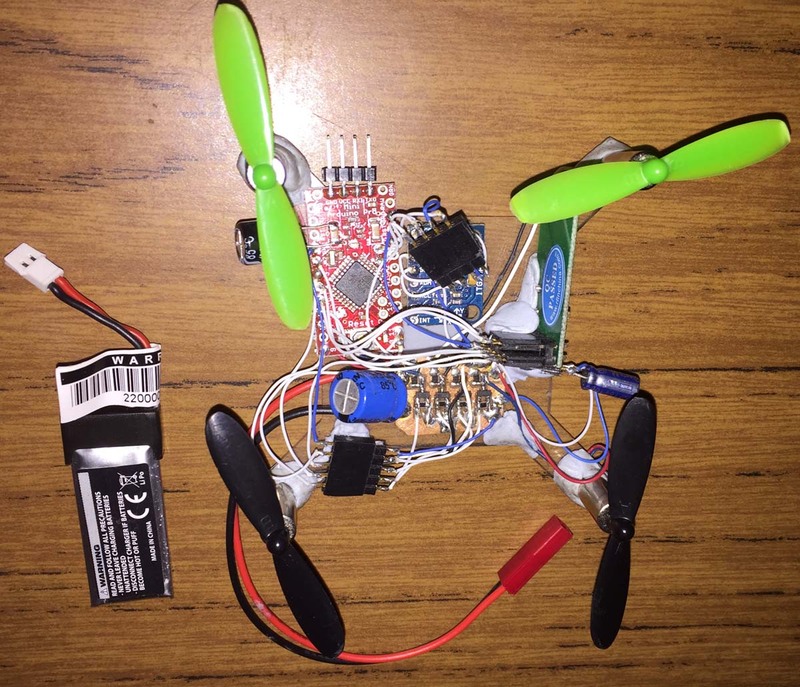 Parts are 4 micro motors (Hubsan X4 H107), a set of propellers to suit, a MPU6050 3 axis accelerometer and gyro, an ATmega (I had re-used a PCB that had it from an old project), 4 mosfets diodes resistors, nRF24 modules and Gameboy controller but it’s all a bit complex. 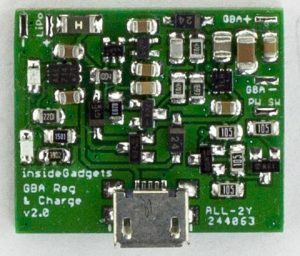 You could simplify it all and just grab a Multiwii board off Ebay for about $20 (or try non-genuine Naze32 from Banggood for $20 too but be careful as I’ve heard people blowing theirs up when connecting the USB), then all you need is the mosfets/PDB and a receiver/transmitter. Questions: are you a programmer by chance what do you do for a living? Another question I was thinking about making a mini quadcopter for an entry into college project. Tell me a way I could make an HC06 module controlled quadcopter with arduino uno, program the firmware from srcatch along with 7mm brushed motors, and MPU 6050. or (( I’ve also bought a CJMCU flight nano STM32 quadcopter with 9DOF sensors. 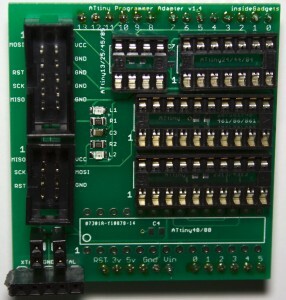 I was thinking about programming this from scratch along with an ST Vlink programmer/debugger. Is this all possible. I dont want to use a controller. I like smart-phone controlled stuff. Is there any way? 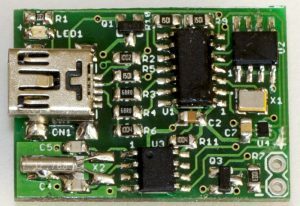 Also I dont use ESC’s, there seems to be FEts integrated on the board I’m trying to use. 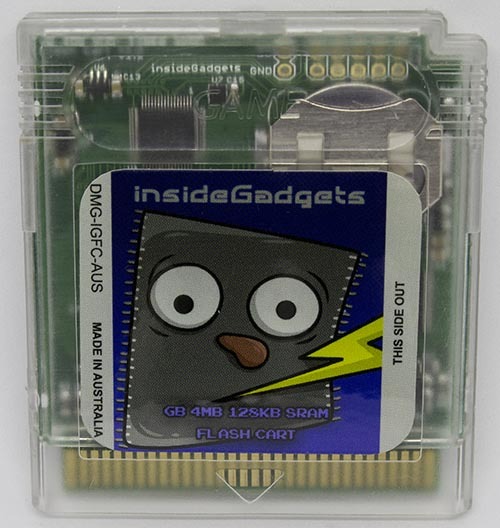 Also whats that part in the top left corner that says INSide gadgets. Is that the reciever? thanks. gonna start making this. Not really a programmer, I’ve been writing code just as part of my hobby, I do IT support as my day job. I think that would all be possible but the the difficult part would be writing the firmware from scratch as you would need to understand and implement your own PID controller with leveling and then write your Andriod app to connect to it but if you research and look at others code it might help to learn it and see if improvements can be made. 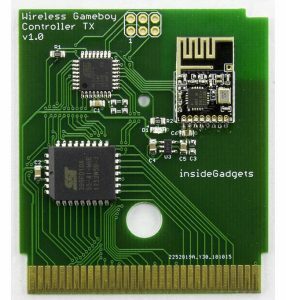 HC06 bluetooth module works but won’t give much range but if it’s going to be controllable by the phone that may be something you don’t really need. The top left board is my old project PCB which has the ATmega with Multiwii. Okay, PID control right, that makes sense. can you code the multwii or naze32 from scratch? thank you for taking the time. last question. thanks for your help alex. If it was to program everything of Multiwii or Naze, I don’t think I could do it all. If I researched the PID loop for some time and looked at some example code, I think it should be possible for just the basic control. I haven’t really worked with ARM before (but I did recently buy an eval board I need to play around with), yes looks like a USB serial TTL should do the job. 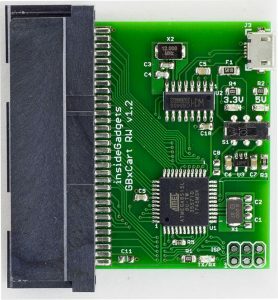 Since you are going for that Ebay frame, I would take a look at the work others have done (looks like the processor is one of the ones that runs the Naze32) and slowly changes parts of it out, like change the receiver to the HC06 controlled by the PC, then change it to the phone, then modify the source to try taking everything out so it’s just the minimum needed, play around with that until you understand how it all works and then write your own. play around with the cleanflight software then right? that’s what works on it? Is that even possible, to mess around with the software? have you made any progress with the eval board all IT work aside? just wondering? 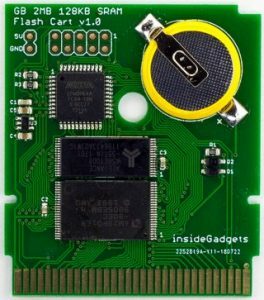 also, do i just need the st vlink 2 dongle or should i get a debugger adapter as well(keil uvision/eclipse+Open OCD+GCC compiler)? i’ve made some progress i guess. Yes, the source is all their for cleanflight or betaflight should you wish to check it out. I haven’t made any progress with the eval board myself, mostly just spending time researching/playing around with settings with betaflight, trying to get a good tune. I would just start of with the STvlink first and see if you really need the debug adapter later on. Hi you have an awesome site. 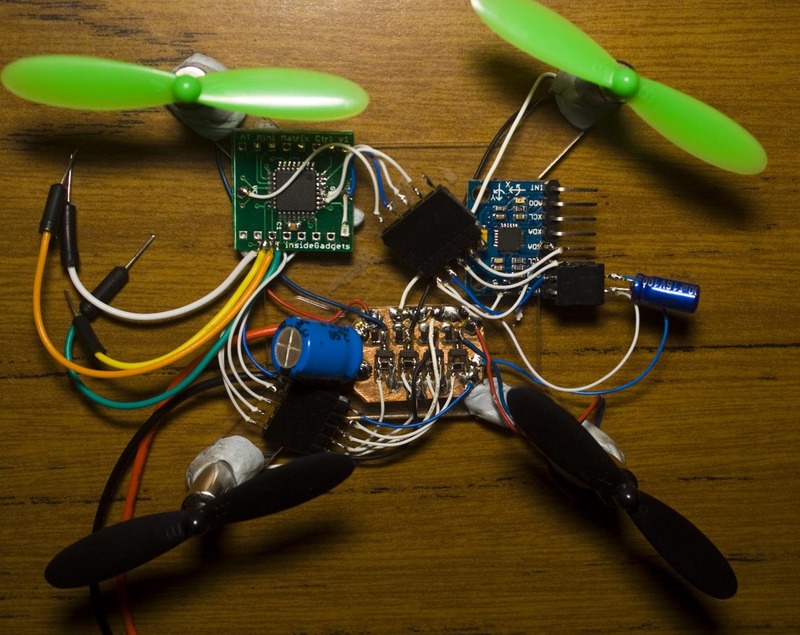 I really like your quadcopter work and your attempt at the FC. its something I’ve been thinking about for a while! just wanted to say you have awesome work and if you have an instagram check out kkuwata.ee I would like to follow you if you have an account. your projects are really cool! insideGadgets © 2019 All Rights Reserved. 57 queries in 0.114 seconds.